Brand purpose: panacea or placebo? Few ideas in marketing today can divide a room as quickly as 'brand purpose'. The big names all come down on one side or the other. 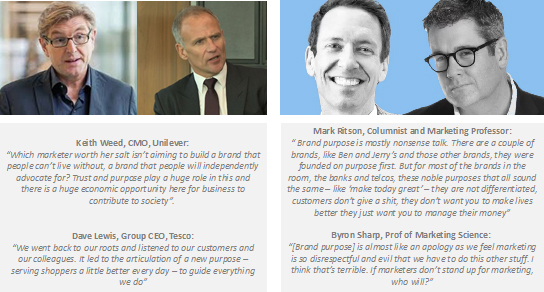 Keith Weed at Unilever and Dave Lewis at Tesco are advocates, Byron Sharp and Mark Ritson are not (Figure 1). For many it's a powerful business tool. For others it's flawed, even an object of ridicule (Figure 2). it's flawed as it prioritises societal over commercial impact.